Ce document au format PDF 1.6 a été généré par Acrobat PDFMaker 7.0 for Word / Acrobat Distiller 7.0 (Windows), et a été envoyé sur fichier-pdf.fr le 18/12/2011 à 17:46, depuis l'adresse IP 197.0.x.x. La présente page de téléchargement du fichier a été vue 2204 fois. Taille du document: 1.2 Mo (29 pages). combined, on plasma lipids and insulin resistance in obese adolescents. homoeostasis model assessment (HOMA-IR) index. in cardiovascular risk factors and HOMA-IR index in obese adolescent boys. alimentaire, pendant deux mois chez des adolescents obèses. et les lipides plasmatiques, indépendamment et combinés chez des adolescents obèses. les programmes. L’estimation de la résistance à l’insuline a été calculée par l’index HOMA-R.
augmenté chez R + E (0,93 ± 0,09 vs 0,68 ± 0,11 ; P &lt; 0,01). E-mail address: omar oda@yahoo.fr (O. Ben Ounis). 1262-3636/$ – see front matter © 2008 Elsevier Masson SAS. All rights reserved. réduction plus importante du niveau des facteurs de risque cardiovasculaire et de l’index HOMA-R.
energy metabolism and insulin sensitivity . overall impact of diet on the risk of cardiovascular disease. exercise may be the optimal approach to controlling dyslipidaemia. training for each of our study subjects. on lipid oxidation during exercise. Medicine, University of Sousse, in Tunisia. • and diet plus training (R + E). by height in meters squared (kg/m2 ). the body using a Harpenden calliper. of two skin folds (triceps and subscapular) in millimetre. • and post-pubertal children were in Tanner stages IV–V. • and the maximum fat-oxidation (LIPOXmax ) point, as previously described [14,13]. comprised 15% proteins, 55% carbohydrates and 30% lipids. continuously monitored (Polar Electro, Kempele, Finland). metabolic cart (ZAN 600, ZAN Messgeräte, Oberthulba, Germany). VO2max = (28.5 × weight) + 288.1. Wmax = VO2 max –10 (× weight) /10.3. test, and before and after the interventions. Anthropometric characteristics are summarized in Table 1.
groups (P &lt; 0.01), and did not differ between the two groups. Anthropometric characteristics and metabolic parameters of adolescents before and after the two-month dietary-restriction (R), exercise-training (E) and diet-plustraining (R + E) programmes. Data are means ± S.D. triglycerides; TC: total cholesterol; HDL-C: high-density lipoprotein cholesterol; LDL-C: low-density lipoprotein cholesterol. * P &lt; 0.05, ** P &lt; 0.01, *** P &lt; 0.001. (HR = 124.5 ± 3.6 bpm; P &lt; 0.05) groups. and −11.2 ± 3.7 kg, respectively; P &lt; 0.001) groups (Table 1). the R group (Fig. 1). of maximum working capacity (%Wmax ). B. Maximum rate of fat oxidation (LIPOXmax ) expressed in mg/min. Values are expressed as means ± S.D. * P &lt; 0.05; *** P &lt; 0.001.
and LDL-C (P &lt; 0.05) (Table 1). measures (P &lt; 0.05), with no changes in either TC or LDL-C.
were observed in the R group in HDL-C/TG ratio (Table 1). P &lt; 0.05 and r = −0.62; P &lt; 0.01, respectively). HDL-C, HDL-C/TG ratio and measures of LIPOXmax . often a reflection of insulin resistance . reduced after a programme of diet combined with physical training. the diet group experienced a decline in HDL-C (P = 0.8). HOMA-IR decreased significantly (P &lt; 0.01) with R + E, suggesting a decrease in insulin resistance. third major cause of insulin resistance is a sedentary lifestyle. and R + E subjects. and the cardiovascular risk factors present in this population. Steinberger J, Daniels SR. Obesity, insulin resistance, diabetes and cardiovascular risk in children. Circulation 2003;107:1448–53. youth aged 11–16 years: cross sectional surveys of waist circumference. Maffeis C, Corciulo N, Livieri C, Rabbone I, Trifirò G, Falomi A, et al. factors in obese girls. Eur J Clin Nutr 2003;57:566–72. utilization during exercise. Obes Res 2002;10:575–84. Kang HS, Gutin B, Barbeau P, Owens S, Lemmon CR, Allison J, et al. adolescents. Med Sci Sports Exerc 2002;34:1920–7. Haskell WL. Exercise-induced changes in plasma lipids and lipoproteins. risk factors. Nutr Metab Cardiovasc Dis 1997;7:293–300. obese adolescents. Diabetes Metab 2003;29:20–7. exercise: the “crossover” concept. J Appl Physiol 1994;76:2253–61. Cole TJ, Bellizzi MC, Flegal KM, Dietz WH. Establishing a standard definition for child overweight and obesity worldwide: international survey. and youth. Hum Biol 1988;60:709–23. 1965. I Arch Dis Child 1966;41:454–71. preparative ultracentrifuge. Clin Chem 1972;18:499–502. Wasserman K, Hansen J, Whipp B. Principles of exercise testing and interpretation. Eds Philadelphia: Lea &amp; Febiger; 1986. pp. 50–80. update. 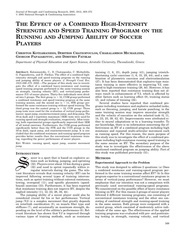 Can J Sports Sci 1991;16:23–9. training. Eur J Appl Physiol 1995;71:523–9. Natarajan S, Glick H, Criqui M, Horowitz D, Lipsitz SR, Kinosian B.
heart disease. Am J Prev Med 2003;25:50–7. glucoregulation. J Clin Endocrinol Metab 2005;90:761–7. Youngren JF, Keen S, Kulp JL, Tanner CJ, Houmard JA, Goldfine ID. Enhanced muscle insulin receptor autophosphorylation with short-term aerobic exercise training. Am J Physiol Endocrinol Metab 2001;280:528–33. obese people. Diabetes Metab 2001;27:466–74. Pascal, Clermont-Ferrand, France, 3 Laboratory of Physiology, Faculty of Sciences, Tunis, Tunisia. exercise training, generally recommended for obese people, induces muscular metabolic changes, which can reverse these defects (Dumortier et al., 2003). plasma lipids (Gerhard et al., 2004). compared with exercise alone (Leon and Sanchez, 2001). values after 2-3 bouts of low to moderate intensity exercise. body composition, plasma lipoprotein, metabolic parameters and circulatory levels of adiponectin in obese girls. parents gave a written informed consent for the experimental protocol. using the standard formula: body mass in kilograms divided by height in meters squared (kg·m-2). all participants before and after the two-month intervention. the body mass of the subject in kg. their Wmax. The results of this test were used to determine the exercise training intensity. (mg·min-1) = 1.6946 VO2 – 1.7012 VCO2. Table 1. Subjects characteristics before and after the two-month program. Data are means (± SD). resistance, TG: triglycerides, TC: total cholesterol, HDL-C: high-density lipoprotein cholesterol, LDL-C: low-density lipoproteincholesterol. * p &lt; 0.05 and ** p &lt; 0.01 before versus after program. and Goldstein, 1983): % CHO = ((R – 0.71) / 0.29) × 100. CHO derived fuels predominates over energy from lipids. standardized index of substrate balance during exercise. warming-up, running, jumping and playing with a ball. All analyses were performed with SPSS for Windows. Results are expressed as mean ± standard deviation (SD). different times of the test, before and after the program. considered to be statistically significant. Figure 1. Percentage change in body fat mass and waist circumference (WC) from pre to post-program. * p &lt; 0.05 and ** p &lt; 0.01 between pre- and post-program. D : diet, E : exercise, D+E : diet+exercise. (ICC=0.98) and skinfold thickness (ICC = 0.97). waist circumference and skinfold thickness. after the program. * p &lt; 0.05 and ** p &lt; 0.01; difference between pre- and post- program. percentage change of body fat mass and waist circumference are presented in Figure 1.
training, as well as the diet/exercise programs (Figure 2). Wmax, respectively) (Figure 2 A). and LIPOXmax points (Figure 2). change after the two-month diet program (Table 1). two-month diet combined with exercise program. (p &lt; 0.05), E (p &lt; 0.05) and D+E groups (p &lt; 0.01) (Figure 4). (r = -0.52; p &lt; 0.01). obese girls. p &lt; 0.05 and ** p &lt; 0.01 compared with the concentrations before the program. (r = 0.28; p &lt; 0.05) and negatively correlated to LIPOXmax (r = -0.30; p &lt; 0.05). body mass (r = 0.26; p &lt; 0.05). improvements in obese girls than diet or exercise alone. and the TC/HDL-C ratio were lower at the end of the twomonth diet/exercise program. difference needed to be considered real. subjects (Brandou et al., 2003; Dumortier et al., 2003). (Van Aggel-Leijssen et al., 2001). factor for cardiovascular disease (Scaglione et al., 2004). 4% (Gordon et al., 1986). the subjects of the D+E group. Accordingly, Wood et al. in HDL-C and a drop in LDL-C.
subjects (Balagopal et al., 2005). = -0.30) or combined with diet (r = -0.52). glucose transporters, which secondarily improves insulinmediated glucose disposal. Presumably, increased oxidation of fatty acids reduces lipid overload, which also increases insulin sensitivity (Goodyear and Kahn, 1998). reduction of TG. In addition, the decrease in serum insulin may also play a role in reducing TG. Obeldicks intervention program (Reinehr et al., 2004). (38.5%) or D (23%) groups. considered as an important determinant of insulin resistance. is secreted exclusively by fat cells (Beltowski, 2003). prevented by inhibitors of transcription and translation. obesity reduces adiponectin protein synthesis by a feedback inhibition (Diez and Igleasis, 2003). adiponectin production could play a role in glucocorticoid-induced insulin resistance. resistance and LDL-C and increasing fat oxidation, HDLC and adiponectin levels in obese girls. Physical Education teachers Emna Makni and Imen Ben Chiekh. a WHO consultation. Diabetes Medicine 15, 539-553.
italiano. Quad Pediatric 3, 44. Miyagawa, J. (1999) Paradoxical decrease of an adiposespecific protein, adiponectin, in obesity. Biochemical and Biophysical of Research Communications 257, 79-83. Bayne, E. (2005) Lifestyle-only intervention attenuates the inflammatory state associated with obesity: a randomized controlled study in adolescents. Journal de Pediatria 146, 342-348.
adipose tissue. Medical Science Monitor 9, 55-61.
obesity. Obesity Research 1, 133-147. Brandou, F., Dumortier, M., Garandeau, P., Mercier, J. and Brun, J.F. utilization during exercise in obese adolescents. Diabetes &amp; Metabolism 29, 20-27. Cummings, D.E. and Schwartz, M.W. (2003) Genetics and pathophysiology of human obesity. Annual Review of Medicine 54, 453471. Déspres, J.P. (2006) Is visceral obesity the cause of the metabolic syndrome? Annals of Medicine 38, 52-63.
lipid oxidation improves body composition and insulin sensitivity in patients with the metabolic syndrome. Diabetes &amp; Metabolism 29, 509-518.
but not fat oxidation in young men. Journal of Applied Physiology 86, 2097-2105. Gerhard, G.T., Ahmann, A., Meeuws, K., McMurry, M.P., Duell, P.B. diabetes. American Journal of Clinical Nutrition 80, 668-673. Gordon, D.J., Knoke, J., Probstfield, J.L., Superko, R. and Tyroler, H.A. coronary primary prevention trial. Circulation 74, 1217-1225.
insulin sensitivity. Annual Review of Medicine 49, 235-261. Okamoto, Y. (2000) Plasma concentrations of a novel, adiposespecific protein, adiponectin, in type 2 diabetic patients. Arteriosclerosis, Thrombosis and Vascular Biology 20, 1595-1599. Sports &amp; Exercise 34, 1920-1927.
cholesterol. An insulin-resistant state. Diabetes 43, 411-417. M.B. And McCartney, J.S. (2002) Effects of the amount and intensity of exercise on plasma lipoproteins. New England Journal of Medicine 347, 1483-1492. Kriketos, A.D., Gan, S.K., Poynten, A.M., Furler, S.M., Chisholm, D.J. and Campbell, L.V. (2004) Exercise increases adiponectin levels and insulin sensitivity in humans. Diabetes Care 27, 629630. Leon, A.S. and Sanchez, O.A. (2001) Response of blood lipids to exercise training alone or combined with dietary intervention. Medicine &amp; Science in Sports &amp; Exercise 33, 502-515.
normal-weight and obese women. European Journal of Endocrinology 147, 173-180. MacArdle, W., Katch, F. and Katch, V. Lea &amp; Febiger, Philadelphia. 121-130. Physiology and Occupational Physiology 71, 523-529.
intracellular trafficking. Diabetes/Metabolism Research and Review 18, 345-356.
of Preventive Medicine 25, 50-57.
before and after weight loss in obese children. Journal of Clinical Endocrinology &amp; Metabolism 89, 3790-3794.
worldwide proportions. Expert Review of Cardiovascular Therapy 2, 203-212.
metabolism in overweight men. Metabolism 46, 217-223. Van Aggel-Leijssen, D.P., Saris, W.H., Hul, G.B. and Van Baak, M.A. 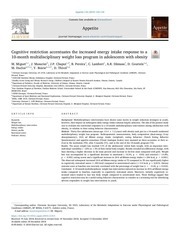 (2001) Short-term effects of weight loss with or without lowintensity exercise training on fat metabolism in obese men. 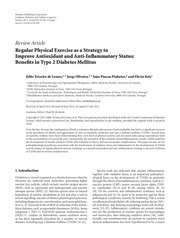 American Journal of Clinical Nutrition 73, 523-531.
sterols and exercise training on cholesterol absorption and synthesis in previously sedentary hyper-cholesterolemic subjects. testing and interpretation. Philadelphia, Lea &amp; Febiger. 50-80.
correlation coefficient and the SEM. Journal of Strength Conditioning Research 19, 231-240.
diet, with or without exercise, in overweight men and women. New England Journal of Medicine 325, 461-466. Matsubara, K. (2002) Correlation of the adipocyte-derived protein adiponectin with insulin resistance index and serum highdensity lipoprotein-cholesterol, independent of body mass index, in the Japanese population. Clinical Science 103, 137-142. Yancy, W.S., Olsen, M.K., Guyton, J.R., Bakst, R.P. and Westman, E.C. trial. Annals of Internal Medicine 140, 769-777.
in obese children. Endocrine Journal 52, 519-524.
composition, adiponectin levels and metabolic parameters in obese girls. improving fat oxidation and HDL- C.
levels with any change of LDL-C and body composition. Methods. – The longitudinal intervention of a two-month program was performed in 54 adolescents, whose body mass index was 30.3 ± 4.0 kg/m2 . were determined before and after each protocol. observed after the program in D + T subject. poids chez des adolescents obèses. Méthodes. – L’intervention longitudinale de deux mois est effectuée chez 54 adolescents, dont l’indice de masse corporelle est de 30,3 ± 4,0 kg/m2 . sont déterminés avant et après le programme. significative entre Lipoxmax et la masse corporelle après le programme chez les sujets du groupe D + T.
0765-1597/$ – see front matter © 2008 Elsevier Masson SAS. All rights reserved. at puberty and in adolescence . activities in the control of body weight in children and adolescents. decreases at high exercise intensity . the two protocols (D + T). and diet associated to training program (D + T). the months of June and July. 3 min of each step . was greater than the 97th percentile . prediction equations of Wasserman et al. for obese children. M is the body mass of the subject in kg. balance of substrates oxidized by the body. a gymnasium and supervised by a physical education teacher. was used to compare between groups and gender. Anthropometric characteristics in the 54 subjects: hypocaloric diet (D), training (T) and diet associated with training (D + T) (mean ± S.D.). BMI: body mass index; FM: fat mass; FFM: fat-free mass. ** p &lt; 0.01; difference between before and after program. were not different between the two groups. 6.3 ± 1.9 kg (p &lt; 0.01) and – 7.0 ± 1.9 kg (p &lt; 0.01) respectively. mass in D + T group (+ 0.7 ± 1.5 kg; p = 0.08). not significantly alter weight, fat mass or fat free mass. Wmax , p = 0.08). increased similarly in the two groups (p &lt; 0.05). groups (r = −0.17; p = 0.14 and r = 0.12; p = 0.21). adolescents within a two-month program. (c) groups. * p &lt; 0.05, ** p &lt; 0.01, *** p &lt; 0.001; significant difference in fat and CHO oxidation between before and after the program. of 53.8% at the end of the program. observation periods are compared for one given subject. the accuracy of our estimated metabolic parameters. and adolescence obesity, because this strategy increased fat oxidation during exercise. 22.5 to 38.2% (p &lt; 0.05) in the D + T group. three groups between before and after the program (* p &lt; 0.05 and ** p &lt; 0.01). fat oxidation induced by body weight loss in the postdiet period. induced by diet restriction . content and insulin sensitivity in obese subjects . E. Makni and I. Ben Cheikh. Education, Scientific Research and Technology. dysfunction. Eur J Clin Invest 2002;32:14–23. J Physiol Endocrinol Metab 2006;291:99–107. Dumortier M, Brandou F, Perez-Martin A, Fedou C, Mercier J, Brun JF. Ekelund U, Aman J, Yngve A, Renman C, Westerterp K, Sjostrom M.
a case-control study. Am J Clin Nutr 2002;76:935–41. training increases fatty acid turnover, but not fat oxidation in young men. exercise and environment. Biochem Soc Trans 2003;31:1270–3. slower rises in ventilation with increasing exercise intensity after training. Eur J Appl Physiol 1995;71:523–9. weight in children. Nutr Metab Cardiovasc Dis 2007;17:394–408. McGilvery RW, Goldstein GW, Biochemistry:. A function approach. Philadelphia: Saunders; 1983. pp. 810–976. Culture and Obesity in Northern Africa. J Nutr 2001;131:887–92. Salans LB, Cushman SW, Weismann RE. Studies of human adipose tissue. effects of low-intensity exercise training on fat metabolism in weightreduced obese men. Metabolism 2002;51:1003–10. metabolism in obese men. Am J Clin Nutr 2001;73:523–31. interpretation. Philadelphia: Lea &amp; Febiger; 1986. Lipoxmax (puissance pour laquelle le taux d’oxydation des lipides est maximal) (n = 9) et (3) programme combiné régime/entraînement (n = 9). © 2009 Publi´e par Elsevier Masson SAS. 0003-4266/$ – see front matter © 2009 Published by Elsevier Masson SAS. © 2009 Published by Elsevier Masson SAS. mass is associated with an increase of leptin . Kondo et al. improvement in BM and/or body composition . 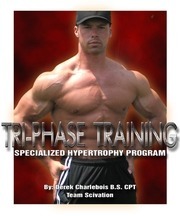 programme than after separate diet or training programmes. of physical activity or sports training. No patients had diabetesrelated complications, and no medications were administered. Lipoxmax group and training combined with diet group. BM in kilograms divided by height in squared meters (kg/m2 ). Two skinfold thicknesses (triceps and subscapular) were measured by the same trained technician (Harpenden caliper). (Wmax ) using the protocol described previously . Wmax = (VO2 max −10(×M)) × (10.3)−1 (M : body mass in kg). − 1.7012 VCO2 (with VO2 and VCO2 expressed in ml/ min). exercise testing. ECG was monitored for the duration of tests. 4.7% for adiponectin and 3 and 3.2% for leptin. intra-assay CV for TNF-␣ and IL-6 assays was less than 10%. The interassay CV was 12.2% for TNF-␣ and 18.2% for IL6. unpaired Student’s t-test was used for group’s comparisons. Subject characteristics pre- and postintervention programme in the diet group (n = 9), the training group (n = 9) and the diet/training group (n = 9). Les caractéristiques des sujets avant et après le programme chez le groupe diet (n = 9), le groupe exercice (n = 9) et le groupe diet/exercice (n = 9). Numbers are mean ± S.D. *: p &lt; 0.05 and **: p &lt; 0.01 post- versus preprogram in the three groups. Lipoxmax : the power at which the highest rate of lipids is oxidized; IL-6: interleukin-6; PS: puberty stage; TNF-␣: tumor necrosis factor-alpha. statistical analyses were performed using SPSS version 8.0. P &lt; 0.05 was considered statistically significant. the intervention showed that they were matched for anthropometric parameters, age, and pubertal stage. diet, training and diet/training groups respectively (Table 1). increase in adiponectin and resistin at the end of the programme. group compared to the others groups (Fig. 1). p &lt; 0.01) in the training and diet/training groups, respectively. Lipoxmax : +23.2. ± 6.6 mg/min; p = 0.4). significant reduction in HOMA-IR (Fig. 3). and other parameters were observed in the diet group (Table 2). after and before the programme. après le programme chez les filles obèses. * p &lt; 0,05 et ** p &lt; 0,01.
between lipid oxidation and body composition changes. the expected effect of a slimming intervention. the combination of the diet plus training was the more effective. changes, which can reverse these defects . both adults  and adolescents  suffering from obesity. this technique in obese adolescent boys . expressed in watts. B: Rate of fat oxidation at Lipoxmax , expressed in mg/min. * p &lt; 0.05 and ** p &lt; 0.01 between before and after the programme. et après le programme : * p &lt; 0,05 et ** p &lt; 0,01. A : Lipoxmax exprimé en watts. B : Taux de l’oxydation des lipides au niveau du Lipoxmax , exprimé en mg/min. HOMA-IR après le programme. * p &lt; 0,05 et ** p &lt; 0,01. Correlation between Lipoxmax and others parameters over the 2-month programme. This study was supported by the Ministry of Higher Education, Scientific Research and Technology of Tunisia. is associated with the improvement of insulin sensitivity. concentrations increase concomitantly with weight loss . increase was associated with the decrease in BMI and the surrogate of insulin resistance (HOMA-IR) in the diet/training group. peroxisome proliferator-activated receptor ␥ (PPAR␥) . of obese individuals after a regular aerobic training programme. by diet or physical activity. bioactive substances. Ann NY Acad Sci 1999;892:146–54. visceral obesity. Intern Med 1999;38:202–6. Ariata Y, Kihara S, Ouchi N, Takahashi M, Maeda K, Miyagawa J, et al. Biochem Biophys Res Commun 1999;257:79–83. Hotamisligil GS. Mechanisms of TNF-alpha induced insulin resistance. Exp Clin Endocrinol Diabetes 1999;107:119–25. prediction of first cardiovascular events. N Engl J Med 2002;347:1557–65. adipokine levels in obese young women. Endocr J 2006;53:189–95. loss in obese children. J Clin Endocrinol Metab 2004;89:3790–4. of endothelial functions in obese women after weight loss over one year. reduced obese men. Metabolism 2002;51:1003–10. calorimetry targeting individuals. Ann Readapt Med Phys 2007;50:520–7. 1965 II. Arch Dis Child 1966;41:613–35. Ben Ounis O, Elloumi M, Ben Chiekh I, Zbidi A, Amri M, Lac G, et al. Wasserman K, Hansen J, Whipp B. Principles of exercise testing and interpretation. Philadelphia: (Ed) Lea &amp; Febiger; 1986. p. 50–80. pubertal obese children. Metabolism 2002;51:1011–6. coefficient and the SEM. J Strength Cond Res 2005;19:231–40. regulation of food intake? Proc Nutr Soc 2002;61:473–87. Oral EA, Simha V, Ruiz E, Andewelt A, Premkumar A, Snell P, et al. Leptinreplacement therapy for lipodystrophy. N Engl J Med 2002;346:570–8. mediated by anorexia. Eur J Endocrinol 2003;148:11–2. subjects. J Clin Endocrinol Metab 2003;88:1594–602. Tomas E, Tsao TS, Saha AK, Murrey HE, Zhang CC, Itani SL, et al. kinase activation. Proc Natl Acad Sci U S A 2002;99:309–13. Yamauchi T, Kamon J, Minokoshi Y, Ito Y, Waki H, Uchida S, et al. Adiponectin stimulates glucose utilization and fatty-acid oxidation by activating AMP-activated protein kinase. Nat Med 2002;8:1288–95. Watt MJ, Steinberg GR, Chan S, Garnham A, Kemp BE, Febbraio MA. AMPK signaling. FASEB J 2004;18:1445–6. Schmitz KH, Jacobs DR, Hong CP, Steinberger J, Moran A, Sinaiko AR. Obes Relat Metab Disord 2002;26:1310–6. female adolescents. Med Sci Sports Exerc 2007;39:1131–8. failure. J Am Coll Cardiol 2002;39:653–63. with chronic heart failure. J Am Coll Cardiol 2003;42:861–8. effects of TNF-␣. Cytokine Growth Factor Rev 2003;14:447–55. Rubin DA, McMurray RG, Harrell JS, Hackney AC, Thorpe DE, Haqq AM. the role of weight status and exercise. Metabolism 2008;57:683–90. weight reduction program. Int J Obes Relat Metab Disord 2001;25:1640–3. Silha JV, Krsek M, Skrha JV, Sucharda P, Nyomba BLG, Murphy LJ. correlations with insulin resistance. Eur J Endocrinol 2003;149:331–5. Lee JH, Chan JL, Yiannakouris N, Kontogianni M, Estrada E, Seip R, et al. diabetic subjects. J Clin Endocrinol Metab 2003;88:4848–56. Ce fichier a été mis en ligne par un utilisateur du site. Identifiant unique du document: 00084235.